We are proud to once again host a variety of outdoor events taking place in Tremblant this summer that will satisfy both young and old. Sports-, food- and music-lovers as well as intrepid travellers will discover memorable events to enjoy all summer long. From July 3 to 12, music and outdoor lovers will be delighted as the Tremblant International Blues Festival takes over the resort! For 10 full days, local and international artists such as Bobby Bazini, Victor Wainwright, Steve Strongman and the Pimps Of Joytime will make their Blues sounds resonate throughout the pedestrian village. The whole family can find something to their liking, with over 100 free outdoor concerts, musical and artistic workshops, the Blues’araoke, the brand new Air Guitar contest, as well as spontaneous live performances and a variety of indoor and outdoor activities offered. Make sure you catch your favourite artists while in town. Check out the full lineup on the Festival’s website. For a healthy dose of endorphins and positive energy, Wanderlust Festival is a must-attend event. Although Wanderlust is centered around yoga and wellness, with local and international instructors teaching a variety of classes, it offers much more than that. We invite you to leave your mat aside for a few hours and join in a group race up the mountain, take in a healthy eating conference or unwind with a meditation session under the sun! And while you’re at it, why not step out on the dance floor or take in a live concert in the evening? 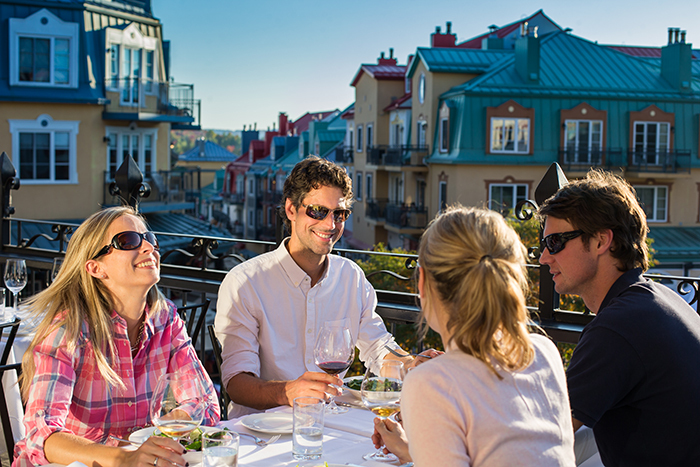 From August 20 to 23, come find your true North in Tremblant. Namaste! From September 12 to 20, foodies will delight in Tremblant Gourmand’s lineup of gourmet activities. The wide selection of food and sports activities available will suit visitors of all tastes and ages. Jump on your bike and join in a gourmet cycling tour or hike up the mountain and stop at gourmet tasting stations along the way. Also, don’t miss the celebrity chef demonstrations and local product tastings taking place in the pedestrian village. And no need to count the calories: by combining physical activity with gourmet endeavours, it all balances out! Like our Facebook page to see the full event lineup and stay on top of everything happening. We look forward to seeing you on the trails or in the pedestrian village’s streets this summer!